Anamika S Jain is a Social Media Consultant and Blogger. She is passionate about topics like Alternative Health Therapies and Hindu Mantras. Goddess Gayatri is worshiped as the mother of all Gods in Hindu Religion. She is the consort of Lord Brahma and culmination of the Goddesses Lakshmi, Parvati and Saraswati. This goddess has five faces and is said to influence the 5 senses or five life forces. 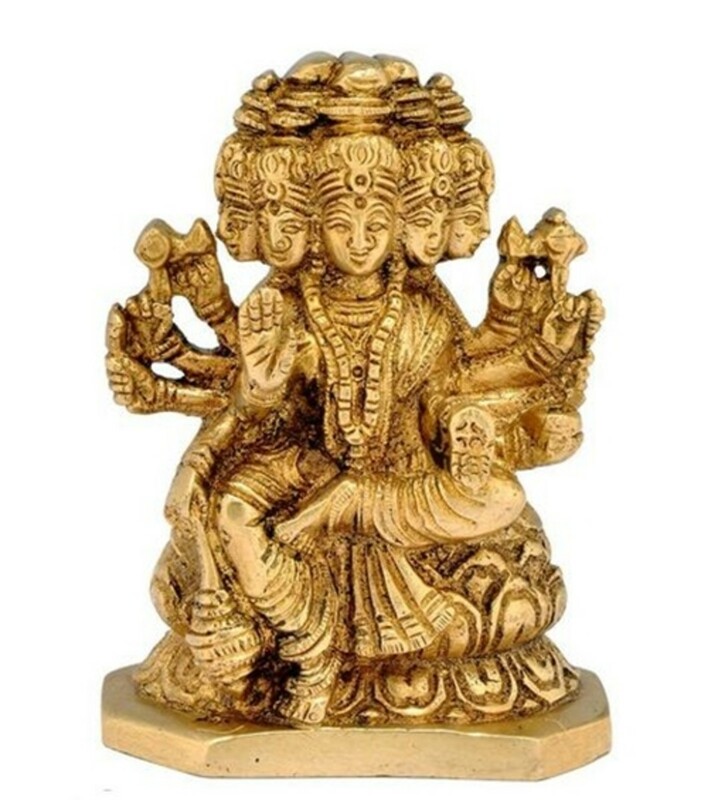 As she has five faces she is also called Panchamukhi. References to this goddess can be found in Rig, Yajur, Saam and Atharva Vedas. This goddess is said to protect and heal all who chants her mantra and helps an individual in spiritual awakening or Self-realization. Gayathri is typically portrayed as seated on a red lotus, signifying wealth. The Gayatri Mantra (also referred to as Gayathri or Gaayathree Mantra) is one of the oldest and most powerful of Sanskrit Mantras. This mantra of Goddess Gayathri is also a prayer to the Sun the giver of light and life. Gayathri is also a highly revered Mantra in Hinduism, second only to Om. This Mantra is a 24-syllable hymn from the Rig Veda which is over 3000 years old and is a confluence of 24 Beej Aksharas. Chanting this mantra can bring happiness in life and shield from difficulties or miseries in life. It also removes all obstacles in life and gives increased wisdom and spiritual growth. This mantra is revered by both Hindus and Buddhists alike. The sound of Gayatri Mantra can lift the believer towards the higher self. Gayathri Mantra is also known as 'Guru Mantra' or 'Savitri Mantra' or ‘Maha Mantra’ or 'Mother of all Mantras' and is useful for activating all chakras. In Hinduism all Gods and Goddesses have a gayatri mantra associated with them. BHARGO DEVASAYA DHEEMAHI, DHIYO YO NAHA PRACHODAYAT." O God! You are Omnipresent, Omnipotent and Almighty. You are all Light and all Knowledge and Bliss. You are Destroyer of fear; you are Creator of this Universe. You are the remover of pain and sorrow and the bestower of happiness. You are the Greatest of all. The Gayatri Mantra should be ideally chanted 3 times a day- at dawn, midday and at dusk facing the sun. The maximum benefit of chanting is said to be obtained by chanting it 108 times. However, one may also chant this for 3, 9, or 18 times. This Mantra should be chanted at medium speed and each mantra chant should be immediately followed by the next chant. The Gayatri Mantra consists of twenty-four syllables which are said to positively affect all the chakras or energy centers in the human body. It is said that 24 Gods can be pleased by chanting this Mantra instead of chanting their individual mantras. This mantra is an important part of the sacred thread ceremony of Brahmin's where it is whispered in the ears of the boy. Even hearing this mantra daily is known to have positive results in individuals. Feng Shui also recommends chanting or playing the Mantra daily to bring positive energy in house. This Blog is dedicated to various Gods and Goddesses of Hindu Religion.One can find all major mantras of Gods and Goddesses here like Shiva, Navagraha, Shani, Krishna ,Ram, Lakshmi , Ganesh, Hanuman, surya, kubera,vishnu,Brahma, saraswati and Durga. Thanks for sharing the meaning of Gayatri Mantra. Anamika , i have been cramming and chanting Gyatri mantra since childhood without knowing its meaning. Thanks for sharing meaning. Voting it up and sharing. Thanks for sharing such knowledge with us. If a person he/she/any gender can chant Gayathri Manta irrespective of cast,creed,nation or anything.If they couldn't time to chant even 10 times they can chant "Om NAMO GAYATHRI MATHRE". This was told by a yogi in Haridwar 75 Years ago.The yogis' routine was daily he visits near by village in Haridwar and sits beneath the tree,and local villagers congregate and he renders the above Mantra to chant,after a while he left to his place.It was a daily routine,after a few weeks passed the Local villagers have noticed they are more happy and their children too are getting into a right path.Importantly in the village Muslims and Hindus have no difference and they use to help each other. Raghubir singh : I have already written two hubs on Sun Worship. Hi Aswin! Nice to know that you liked the Hub. 1. It is called Gayathri mantra because of the fact that it is composed in Gayathri metre(Chandas). 2 It is actually, the praise and prayer to Sun god-the source of all energy to the whole planet/solar system. 3Sun is prayed because,without him there cannot be any life or activity in the whole world. Just see how scientific, and full of gratitude, the Indian mind is! You can chants Gayatri mantra with different combination of Om...Using 3 Om before startin middle and at last after mantraIt is good for students.and there are different combination such as 5 Om, 6 Om , 9 Om and 12 and 24 OmYou need go for multiple of 24 for chant as it is 24 word manta...For getting Siddhis of this mantra chantting is quite high as 24lakhs which generally santas do in forest..